At work on Monday, July 8th , I was clearing away some weeds so I could clean a basement window. I was alone at a house, getting it ready for sale. I sat down on the ground and had my feet in the window well as I was pulling away the weeds. I must have stirred up a wasps’ nest. Suddenly, yellow jackets were swarming all around, stinging me! It was a panic. I’d never been stung multiple times, before. In the short time it took for me to jump up and run away – brushing them away with my hands, beating the air with a towel – time slowed down. I didn’t know how many times I was going to get stung; or if I was going to have an allergic reaction. I got stung at least 6 times by the little buggers – 4 times on the inside of my upper left arm; on my left ring finger; and the back of my right ear lobe. Ouch! I think I got stung a couple of times around my ankles, too, but I had on heavy socks and barely felt it. Fortunately, they were just tiny, maybe 15-20 millimeters. Surprise, surprise! I didn’t know that some wasps make their nests on the ground. A friend later told me that it’s the ground-nesting wasps – yellow jaclets – that are more aggressive. A window well with a lot of old dried-up weeds is apparently an especially attractive place for them to nest. 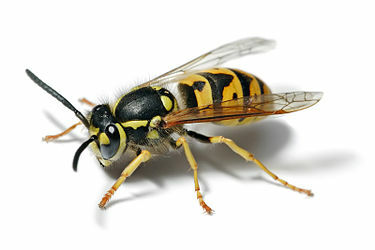 Unlike bees, wasps can sting you several times in quick succession. The venom contains a pheromone that attracts other wasps, too. I managed to escape the wasps and went inside the house to regroup. I was in pain and a little dazed. I didn’t seem to be having a very bad reaction other than that. The pain was acute, but not overwhelming. I ignored it, filled with hubris at my imperviousness. I brushed it off as an interesting anecdote, a good story to share. These little pests had surprised the heck out of me! I thought it might be helpful for other people to know that wasps can nest down in the ground like that. Next time, I’ll inspect carefully before I plop my feet down into a window well – maybe make a few tentative pokes with a pole. The following Sunday – six days later – the weather here continued to be warm. I was mindlessly scratching myself and accidentally agitated the stings on my arm. I stopped as soon as I realized what I was doing. The next morning it persisted, though; maybe even a little worse. I took an antihistamine, which helped. By the evening, though – after working 5 hours – it’d really flared up. There was a big red, swollen area a couple of inches across. I sprayed on some ‘antibacterial pain relieving spray’ of unknown vintage. That just made it worse. I started to become very concerned as to the state of my health. A friend had been hospitalized last December with a staph infection. It was incredibly frightening! She had a big abcess on her inner thigh. It had almost broken out into her bloodstream, which could’ve been fatal. My poor friend was absolutely traumatized. She was also doped up out her mind on all the morphine they were giving her; a drug she was not familiar with. As she turned on me in anger, I explained that it was the drugs talking to her. Thank gods that we both pulled through that one together; our friendship ultimately stronger than ever. This all came back to me, now. Was I getting some potentially necrotic, irreversible ailment?! “If condition persists after a week, get thee to a doctor.” Sweet jay-zus! I looked up what remedies might be recommended for the itchiness, then conveyed mineself to the farmacia. I perused the various ointments and such as were on offer for this type of ailment. “DO NOT USE IF YOU HAVE ALREADY TAKEN ORAL ANTIHISTAMINES,” it said. I narrowed my choices down to a tube of hydrocortisone and some good ol’ Calamine lotion. I paid my money and absconded with the remedies. I wiped off the hydrocortisone and started in with the Calamine. “Hmmm, yes, that’s… doing something…” Once it dried, I kept repeating the process until I had applied several layers. Soon I had a nice opaque, solid coat of it on there. Yes, this was working! Well, there you have it! How I persevered with potentially necrotic wasp bites and survived the crisis with my dear friend, whom shall presently remain anonymous. FYI ! Ouch. Glad you made it through!